Did you ever feel like the whole world was against you and it was because you were black? Or white? Or Muslim? Or Hispanic? Or white? Or whatever? And more than anything, you wanted to see a movie that confirmed your suspicions, so that you knew you weren’t just imaging it? Only to preach at you that your problem might be as much your own racism as it is the racism of others? Well, if you did, Crash is the film for you. Or, did you ever feel like people hurt each other, simply so they feel alive? Well, if you did, Crash is also the film for you. Or, did you ever wonder why it is that people crash into each other? 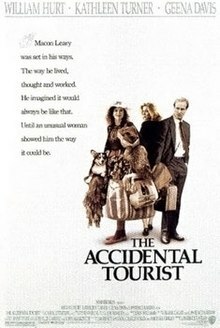 The Accidental Tourist is a quiet, earnest story, about a travel writer (William Hurt) who specializes in creating comfortable travel experiences – the key is control and predictability. But, it’s not merely his writing which advocates predictability – rather, his whole worldview is based on sticking things in a rut and making sure they stay in them. And honestly, it’s a viewpoint well-earned, as his entirely family (two brothers, one sister) also seem willfully stuck in their comfortable little ruts, with their comfortable little quirks.